- Knock on wood! But the way both of you have been behaving is nothing short of awesome! Great job V and J. I mean I can actually take 45 minute long showers in contrast to the 1 minute loo break that I dreaded taking at times. You work silently on worksheets, talk to each other about the colors that will look good on whatever it is you are coloring, Vansh, you help Jiya with writing letters and when I come out from the shower, you are playing nicely and talking to each other even more nicely. And today you actually told me, "Mom, we are kind of fighting but just with words and not with our hands!" How cool is that! And then after a few more minutes, "Even the word fight is over!" *Phew* I wonder you are the same children from the posts above. Yes you have your moments of getting on each others' nerves and mine but then phrases like the ones I just mentioned so make up for it. - And Jiya, how is it that when I tell you to clean up, there is a possibility that it might fall on deaf ears (sometimes, I have to admit :) but when your hero, your older brother tells you that, I can be certain that the job will be done :) And yes, I am talking about cleaning up here, can you believe it!! So well, atta boy and atta girl! I am so loving this gig of being your mom at this phase - laughing, playing, clowning around! Amen to more such times! Oh noonoo ..Vansh and Jiya do that too but even if they play nicely 50-60% of the times, its remarkable in my eyes esp after the bad bad phases they go through. Vansh too loves to tease her - exactly in the way u mention - just take her things for the heck of it or just touch the things she is being touchy abt. And then has that silly smile on his face! aww..thats a VERY sweet post ! God bless them both ! Lovely post and such a cute pic there! 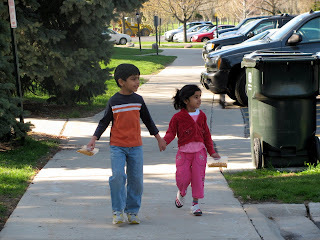 Swati: Thank u dear ..u'll have ur share of such sweet sibling moments soon :) Hope u r doing well. Mystic: Hey, long long time! Great to connect again. Hope u and P are doing great! I did see that u have joined the NaBloPoMo :) Good luck! Thanks for this post Neera. It shows me that atleast the future is bright for me. 45 min showers... what a luxury!!! Garfield Park Conservatory - a true gem!